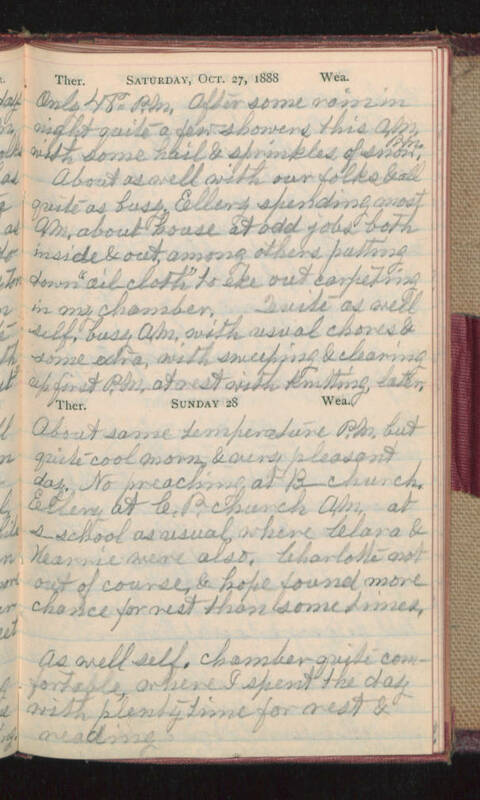 Saturday, Oct. 27, 1888 Only 48° P.M. After some rain in night quite a few showers this A.M. with some hail & sprinkles of snow P.M. About as well with our folks & all quite as busy, Ellery spending most A.M. about house at odd jobs both inside & out, among others putting down "oil cloth" to eke out carpeting in my chamber. Quite as well self, busy A,M. with usual chores & some extra, with sweeping & cleaning up first P.M. & rest with knitting, later. Sunday 28 About same temperature P.M. but quite cool morn & very pleasant day. No preaching at B- church. Ellery at C.P. church A.M. at s-school as usual, where Clara & Karrie were also. Charlotte not out of course, & hope found more chance for rest than some times. As well self, chamber quite comfortable, where I spent the day with plenty time for rest & reading.